2012 Breygent Red Sonja cards are the first for the scantily clad comic character in several years. Combining stunning artwork, a huge variety of sketch card artists, autographs and additional chase cards, the release mirrors Breygent's successful Vampirella set from 2011. 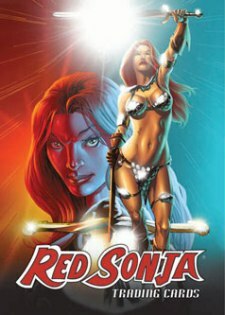 Created by Roy Thomas and Barry Windsor-Smith, Red Sonja is a fantasy character that first appeared in Conan the Barbarian. Wearing few clothes and wielding a big sword, she's a sexier version of Conan, which is a big part of her appeal among fans. 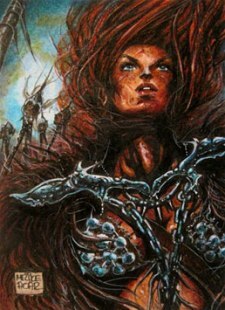 2012 Breygent Red Sonja is produced in conjunction with Dynamite Entertainment, the current Red Sonja comic publisher. 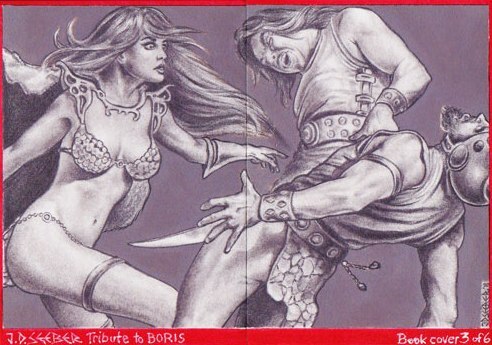 Breygent is producing a 72-card base set that showcases vivid Red Sonja art. One base set is comes with every 2012 Breygent Red Sonja box set. Every box set includes two hits including at least one Sketch Card. The second hit is either a second Sketch Card, an Autograph or a Line Art Card. More than 80 artists are contributing sketch cards for the release. Autograph signers include Red Sonja artists J.G. Jones, Greg Land, Marat Mychaels, Lucio Parrillo, Paul Renaud, Mel Ruby and Steve Sadowski. 3-D Lenticular Cards (15 cards, four per box set). Puzzle Cards (Nine cards, four per box set). Red Sonja vs. Thulsa Doom (Three cards, one per box set). Sold separately, a binder comes with two exclusive promos.